As society becomes more aware of the significance of the environment, such issues become increasingly important. 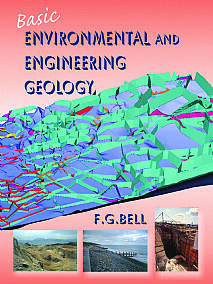 The book exemplifies the vital role of environmental geology and geological processes in understanding the physical environment and the influence and fundamental importance of engineering geology in our modern world, particularly the infrastructure, whether it be foundations, routeways or reservoirs. The influence of geohazards, the significance of soil and water resources, and the impact of mining, waste disposal and pollution/contamination on the environment are all examined in this book. The various aspects of construction that are involved in the development of the infrastructure are also discussed - land evaluation and geological construction materials are therefore taken account of in this context. The book provides a wealth of practical examples and a comprehensive suggested reading list is provided for each chapter. Basic geology; Geology and planning; Natural geohazards; Water resources; Soil and the environment; Mining and the environment; Waste, contamination and the environment; Land evaluation and site assessment; Engineering aspects of soils and rocks; Geology and construction materials; Geology and construction. Advanced undergraduates and postgraduates in geology, engineering geology, civil engineering, physical geography and environmental science and planning. Environmental geologists, environmental scientists, managers and planners including civil engineers, builders and architects will find this book of immense value.